This tutorial is for Dojo 1.9 and may be out of date. Up to date tutorials are available. On the other hand, I have prepared a GitHub repository which contains a sub-module that pulls the right parts of Dojo into a project. It also follows the suggested layout of files and directories which will be used in this tutorial. Built distributions or CDN distributions of Dojo will not work with Node.js, as they are all built assuming you are using a browser user agent. Built, compressed code also makes it very difficult to debug your server side applications, so stick with a source distribution. You might be saying to yourself "I thought AMD was for the client, why would I want to run it on a server?". While the server side doesn't "need" AMD as much as the client-side, there is minimal overhead and no disadvantages to AMD on the server-side. It also means that your modules and coding style can be consistent across the client and server. Using the same language only gets you so far, but if you have a single coding style, then you can even more rapidly write code. Sadly for developers, who want other to use their packages and modules to run either on the server or in a browser client have to support both CommonJS packaging and modules as well as AMD modules. There is an increasing number of packages that support both CommonJS and AMD and who knows what we will see in the future as far as standards. The good news is that the Dojo AMD loader works perfectly well under Node.js, and after a little bit of work, you can start coding in an AMD/Dojo like environment. In order to load an AMD module under NodeJS, we need a module loader. The require() that comes default with Node.js can only load CommonJS modules. The Dojo AMD loader (as well as other loaders, like RequireJS) can be "bootstrapped" to allow you to have an "AMD environment". // explicit about our package map. // The module to "bootstrap"
deps: [ loadModule ] // And array of modules to load on "boot"
The boilerplate mentioned above also includes a script named boot.js which is a handy tool for just booting a module from the command line. For example, to boot the server, you would run node boot "app-server/server". Once you are in the AMD world, require() and define() work in an AMD way. You can load modules just like you would on the client side. The challenge though comes in when you want to leverage a standard CommonJS module, which is what Node.js uses. Since require() has been "overwritten" with the AMD one, just calling require() will not load the CommonJS module any more. Dojo has a solution to that, as of Dojo 1.8, there is an AMD plugin module named dojo/node which will load a CommonJS module for you. Paths, both for the dojo/node for loading modules and when using the file system are relative to where the node is invoked. So even though our module was ./app-server/server.js we utilised paths relative to the root of our project. The exception to this is that relative paths for define() work just like they do in the browser, which is relative to the path of the module. So, now that we are running AMD modules with the Dojo loader under Node.js we have started our journey. But we wouldn't gain enough benefits unless we transform more of our coding style to the "Dojo-way", and there can be a of advantages to following the "Dojo-way". Not only do you share the same coding style on your server side and client side code, but you also can take advantage of Dojo Promises, Dojo Requests, Dojo i18n, Dojo Topics and Events as well as the richness of other AMD that are available. One of the powerful features of Node.js is its non-blocking nature. The vast majority of core APIs in Node.js run asynchronously. The default way though this is done is through an async callback function. If you have worked with Dojo for any length of time, you are likely familiar with the power of dealing with asnyc functionality through Deferreds and Promises. There are some other frameworks out there that provide a promise based interface for Node.js, but using since Dojo already has a promise framework, we will use that. Now when we interface with the readFilePromise we can utilise the promise pattern for handling the asynchronous function. This includes the ability to change promises, which can come in quite handy then make the code much more readable than "callback within callback", which you would have to do if you followed the Node.js async model. In practical purposes, you wouldn't create a function every time to just then use it as a promise. You would likely create a module which exposes the functions you want to return promises and load that module in order to utilise the "promise" version of the functions. I have created a package that provides a lot of this functionality "out of the box". It is called setten. It is available under the same license as the Dojo Toolkit and everything has been contributed under the Dojo Foundation's CLA. Hopefully it will continue to grow over time, providing useful modules that can make working with Node.js more "Dojo-like". In particular, it has a module named setten/util which can transform async callback functions into promise based ones, by using util.asDeferred(). Now that we have some of the "basics" out of the way, it is likely that if you are reading this tutorial, you have a desire to create a combined client/server application in Node.js. One where you have Dojo-style coding for your server and Dojo-style coding for your client code. While building whole applications is beyond the capabilities of this tutorial, I will try to give you some advice and structure. src/app - For modules that are shared between the server and the client. src/app-server - For your base server module and other modules only used by the server. src/app-client - For your client modules. You would create Dojo build profiles for the app and app-client packages so they could be built by the Dojo builder and you would create an overall application build profile that would be used to identify your layers, which would be served up by your server. The boilerplate I mention above has this framework all laid out for you, plus includes a build.sh and build.bat which will invoke the build process to generate a build for you. The build will be output to the lib path. When this code is built by the Dojo builder, and if we use Google Closure to optimise our code, then dead branch removal would occur, which would eliminate the server side code from our modules. Personally, I like the separation of concerns, where modules are either designed to run on the server, the client or both, and it makes it "cleaner" to do builds and not fully rely on the code optimisation to ensure the server side code doesn't get distributed to the client. This alternative pattern though is wholly viable. For more on building code, take a look at the Creating Builds tutorial. Hopefully this tutorial has given you a view of how to get started using Dojo under Node.js. I personally think there is a lot of power in being able to use the same language and patterns that you use on the client as well as the server. While other technologies and languages have tried to blur the line between the client and server before, I think we are starting to see situations where our code can be truly isomorphic and not worry about the specific context that it is executing in. Here are some things I or others have done under Node.js to maybe spark some ideas for you. Personally I "replaced" any server side code I write with Dojo running under NodeJS. 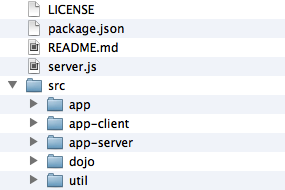 There maybe no limit to the number of things that can be done with Dojo under NodeJS. Good luck and see what sort of interesting things you can think of to do.